Working up to putting on a mask for the first time in a meeting was a big deal. First there was the making of it. The form – a life mask lovingly fitted to my face – had been made 6 or 7 years before in a Mixed Group gathering. Back then I had a strong sense of it wanting to be an old woman and I had gotten as far as putting wrinkles on the paper mache cast. I imagined it painted white and representing the North. It was at this point I had stalled all these years. I could envision moss and sticks but could get no further. As it turned out she is the North but a very particular North – The Mountain. Our Neahkahnie. So when Lola Sorensen said she was wanting to try to incorporate it as part of community visioning for the Nehalem Bay area, Tom and I jumped to help take it the next step. How would it feel to be doing brainstorming and organizing work with the representatives of the wild ones present there in the room with us? What would shift in the dynamics? How would declaring sacred space alter the ideas and then the actions that resulted? We decided to start small – a planning meeting at her house where we’d invite people we knew would be comfortable with the experiment as well as people we weren’t so sure of. People who’d been in on vision processes of various sorts before (in some cases many such meetings) and those new to such things, even new to the community – i.e. both those who might be pretty jaded about how hard it is to get things done and those who still have their innocence – or at least their optimism. Though I’ve always had a sense that this process would work – indeed, work very powerfully, I never thought of being one of the representatives myself. I imagined that I would want to be in on the idea making, would be needed to manage the process, would want to be in my usual place in the midst of the action – not hemmed in by such a different sort of role. But the idea of actually being under one of the masks began to niggle at the edges of my consciousness and it made me realize how attached I was to being in my accustomed stance. Hmmm. How much ego involvement was there that I should think my input so necessary?? So the more I thought about it the more it felt right to try the new role. My ego could say that this is where the experimental edge is. The rest of me could simply feel happy and up for a new adventure. Indeed, being under the mask fit well with the transition I have been taking more and more in meetings since leaving Cartm Recycling in the fall of 2002 – that of observer, historian. Ballast maybe. Certainly not major organizer or even willing to volunteer for a lot of the “getting things done” parts. As I realized all that, I could feel my body settle more and more comfortably into the idea of being in a mask. But who should I represent?? Salmon and rivers and the ocean are important to me – astrologically I’m a double Cancer after all – but that didn’t feel quite right, at least for the first go round… It was thus with great pleasure that I woke up one morning and realized I wanted to “be” the Mountain. She/he who watches over us all, has called us here to do our work. And with whom I connect very closely in my personal evolution. The Mountain was already working through me in a number of mysterious ways. And it was then that I remembered the long unfinished mask. Perhaps it had been waiting all this time. There was still a week or so of creation delaying tactics but two days before the scheduled planning meeting I finally gathered mossy sticks, usnea, glue gun, green paint, newspaper and a dusty mask, and had myself a grand old time melding them into a coherent whole. The wispy strands from the hot glue became spider silk. Feathers, a robin’s egg, a dried rosebud were added on, as was a piece of glass on the third eye from a window shattered in our house fire in 1978. She was beautiful! An ancient crone. A wise one. Fire Mountain. Neahkahnie Mama. The finishing touches came in a flurry minutes before we were to leave for the meeting. The ribbon ties that I had imagined to be the easy part didn’t quite work and the mask kept sliding down. New holes? With Tom’s help, padding under the top and shoelaces instead of ribbons, as well as an extra tie from the top joining the side ones finally worked. So I felt a little frantic as we headed out the door. Smudging it would have to wait for Lola’s help. All of that kept me distracted from worrying too much about the other details of the process. 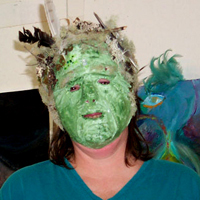 Like how would people react to smudge and altars, indeed, to the masks themselves?? How to explain what we were doing? This was another level of coming out for those of us with a different spiritual bent – one not often encountered in the public eye. We were taking yet another step of showing ourselves in our small town culture. Tom & I had left the details up to Lola, proud of her courage. I could tell she shared some of the same fears, but we didn’t voice them too much and her determination carried the three of us through as people came in and were smudged before finding their seats. It carried through as she grounded us with a simple calling of the directions. It carried through in her reading of a description of the process from The Fifth Sacred Thing. It carried through as we introduced ourselves by passing a talking stick around the circle (I cringed for a minute as she referred to it as her wand – and smiled at my fears). It carried through as I spoke briefly about my intentions before putting on the mask…. At first it was stifling. I realized I had forgotten to take a drink of water. Was a little pinch under my chin going to become excruciating? I almost panicked. I told myself I could certainly take it off if I really needed to. I could see out – quite well in fact. I could breath just fine. I grounded and called the spirit of the Mountain to come into me. Sent my roots down. Opened to the sky and the birds whose feathers I was wearing. And as I calmed, I could feel the energy settle in the room. Everyone else had to get used to this too. Probably they were also wondering how it felt to me. The discussion began, haltingly at first as it always does in a new group, and then gathered momentum. Ideas began to flow. People began to speak of their experiences and examples from other places they wanted to reproduce. Their discouragements, their successes. Their dreams and their fears. Mountains are very quiet, of course. Sometimes I longed to chime in with an idea. I reminded myself that the idea might well come up shortly and often it did. Where I might have spoken up with some bit of history from my perspective, I learned something new about other people’s perceptions of circumstances I’d been closely involved in. I only spoke once. Craig Mackie was chastising himself about not being able to foresee pitfalls that led to not getting a community garden going in Wheeler last summer. The Mountain reminded him that he’d taken the first step, that he’d opened an important door and who knew what would happen next. It felt like I was speaking with the wisdom of the ages – a much, much wider perspective than any of us humans have. Since I was in a deep listening stance, I could feel the energy flow in the room. At first people referred to “Lane sitting there” but then they shifted to making comments now and then about “the Mountain.” Each time that happened it sent me even deeper and gave great pleasure both that a kind of shift had been made and also that her presence was influencing the discussion. There were times when I could feel discouragement begin to take hold in the room (or in myself). If I reminded myself that I was the Mountain and not Lane, then rather than get trapped into thinking towards solutions, I sent down new roots, at which point I could feel the air lighten and the positive possibilities begin to flow again. I was the only one planning to “aspect” for this go round. But at the last minute setting up we had put three other masks out, one for each of the other directions. It felt good to have them at least represented and they were available in case someone else wanted to try it. And indeed, there came a moment when Vivi Tallman put on the Coyote mask where she was sitting in the south – perfect for her who identifies a great deal with Coyote and owns Helen Hill’s Coyote sculpture. She had to hold it in front of her face so she was sort of appropriately in and out of the persona. It felt good to the Mountain to have company. Tom commented in our debrief at the end that it would have been more effective had I been in full costume and so was another step removed from Lane sitting there wearing a mask to simply being the Mountain. And I agreed. But I had purposely just worn a green skirt and shawl because I didn’t want to be too imposing as people came in the door and wanted as well to be able to transition comfortably back out if need be. It felt like it was an appropriate level of involvement for a first go round. At noon, after an hour and a half of discussion, the group was ready to close. Some exciting ideas had gelled, some tentative plans had been made for the future. A healers guild, a guerilla extension of the 4th of July Parade, a mask making gathering before another larger meeting. It was time to debrief on process. Everyone wanted to know how it had been for the Mountain. When I first came out of the mask I had a very difficult time finding words. We’ll have to work on creating a gentle process for that transition. But as my own self emerged I described my experience of the meeting pretty much as I have here. And then I couldn’t resist some very un-mountainly comments about ideas and follow-up. The old self reasserted itself even more as a couple of us headed off to talk further over lunch. All in all it was a powerful experience. To be a deep listener. To watch the flow. To feel the influence of The Mountain. To bond with the mask, so long in gestation. As it turned out her birth was waiting for a very particular purpose. Or so it seems at this point. We’ll see what happens next.